The Museum of Modern Art’s grand, sometimes grating 40-year survey of the German sculptor Isa Genzken is a disturbance in the force of the New York art world. It counters the season’s trend of big retrospectives devoted to male artists and increases from a paltry four to a still paltry five the number of full-dress sixth-floor retrospectives the Modern has bestowed upon women since taking back its expanded building nine years ago. “Isa Genzken: Retrospective” also makes the museum feel alive and part of the art world, rather than a tourist destination where everyone lines up for the Magritte show or throngs the modernist parts of the collection even as galleries devoted to overthought, pleasure-averse displays of recent art stand virtually empty. The dour, largely color-free sampling of art since 1980 in the museum’s large second-floor galleries is a perfect example. Upstairs, the best parts of the Genzken show present a markedly different species, one that is brash, improvisational, full of searing color and attitude and that decimates taste and frequently looks nothing like art. Inspired by popular culture and historic events, and influenced by its creator’s many annual trips to New York, Ms. Genzken’s mature efforts are bristling assemblages and installations that she began making in 1997, using cheesy materials and objects to concoct a raw, unapologetic beauty and a weirdly elliptical if literal-minded social commentary, often about the United States, power and war. Their seemingly jerry-built components run to office furniture, tiny toy soldiers and cars, baking pans, torn beach umbrellas, mirrored foil, metallic tape, ribbons, jewelry, fabric and all manner of bright colored plastic — flowers, chairs, rain boots, American eagles, bowls, buckets. Architecture is a frequent inspiration and reference. Ms. Genzken, who turns 65 next week, has spent so much time in New York that she might almost qualify as a German-American artist. It is hard to imagine her work without the city’s skyscrapers, street life, trash and style, not to mention Canal Street and its rich vein of cheap shiny materials and job lots, already exploited by artists across generations and as diverse as Lucas Samaras, Lynda Benglis and Steve Keister. And while it may be largely a coincidence, most of her best work has been done since the Sept. 11 attacks, which she witnessed during a visit here and has made one of her themes, especially in the superbly assured works in the show’s final and strongest gallery. The first comprehensive Genzken exhibition in an American museum, this show has been organized by Laura Hoptman, the Modern’s curator of painting and sculpture, and Sabine Breitwieser, its former curator of media and performance art and now director of the Museum der Moderne in Salzburg, Austria. They collaborated with curators at the museums to which it will travel: Michael Darling of the Museum of Contemporary Art, Chicago, and Jeffrey Grove of the Dallas Museum of Art. Ms. Genzken is unusually prolific, and the group’s effort provides plenty to look at and only improves as it goes along, cycling and recycling through an extraordinary range of postwar styles, from Abstract Expressionism, Pop, Minimalism and Conceptualism up to the present. This exhibition is a one-artist celebration of the increasingly loose-jointed, detached form of assemblage that may be the central, most robust aesthetic of our time. This tendency was explored in 2007 at the New Museum with “Unmonumental,” a broad survey of 30 assemblage artists. As the oldest participant in “Unmonumental” by at least 14 years, Ms. Genzken was its presumptive éminence grise. Yet her originality and influence, while often alluded to, are rarely parsed in detail, and the Modern’s catalog continues this habit. I don’t doubt her influence on many younger, especially European artists. But she is one of a host of women who began in the late 1980s to view assemblage — the piecing of disparate parts into unruly wholes — as an expansive, unbounded, antiheroic mode that could be simultaneously personal, political and formal. Several of these women — including Jessica Stockholder, Cady Noland, Sarah Lucas and Rachel Harrison — actually began expanding assemblage before Ms. Genzken. 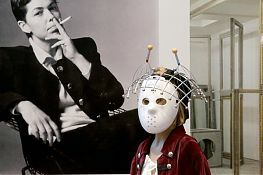 Sadly, the catalog essays associate Ms. Genzken only with established names like Joseph Beuys, Gerhard Richter (to whom she was married in the 1970s and ’80s), Eva Hesse, Dan Graham and a few others. It omits Sigmar Polke, whose pop-culture-based, often tawdry paintings are at least a precedent, and Rosemarie Trockel, another female German artist of her generation struggling in a field that was and maybe still is unusually male. Whether by the writers’ choice or Ms. Genzken’s directive, these omissions perpetuate the myth of the artist as isolated genius unconnected to a crowded field. The same questions apply to the catalog, which does not mention that her grandfather — whom she may have met only once — was a Nazi, which is strange for an artist for whom catastrophe is a theme. But back to the show, which begins by setting the teeth on edge with 12 raucous new sculptures in the form of bizarre looking “Schauspieler” (“Actors”) mannequins. Clustered a bit too densely outside the entrance, they are garbed in strange combinations of garments and headgear and festooned with swaths of fabric and various masks. Forming a very mixed gathering that evokes the homeless, loners, extreme fashionistas, transvestites and members of other subcultures, these beings pay tribute to difference, eccentricity and imagination. Yet they are so outlandish that the mannequins also serve as pedestals for the assemblage sculpture they wear. And as if this weren’t enough, the walls behind them are covered with posters for her previous exhibitions. Impressively large, some feature photographs of her, including one in which she slouches in a chair in a black jacket and pants. Suggesting a well-known image of Marlene Dietrich in a tuxedo, it is evidence of the cool, clearly competitive, sexually ambiguous persona Ms. Genzken often presents. In the galleries, the works move in roughly chronological fashion, in distinct, often startling series, presenting an artist who seems to become younger and more vital with each decade, as her work becomes more spontaneous and grounded in reality. Sleek, painted-wood, low-lying floor pieces — evoking futuristic weapons or spaceships — and a few feints at found objects and Conceptual art give way to rough ruinlike structures from cast concrete and paint. While not terribly original, they strike a haunted emotional note and, shown with a series of translucent resin pieces resembling French windows, turn the show’s largest gallery into an eerie indoor Monument Valley. Around the edges of these early series are undistinguished paintings, some openly derivative of Mr. Richter’s work, and glimpses of spontaneity: a few small aggressively modeled forms in plaster, one garnished with bits of trash and two wiglike formations of bright epoxy resin poured over cloth, slowly rotating on motorized iron poles, looking a little like severed heads. Some of these pieces reveal a talent for conjuring competing senses of scale and reality, the way painters often combine contrasting notions of space. First, the concrete pieces have high steel pedestals that enable them to loom above the viewer. In later works, she juxtaposes everyday objects with small figures that give them a monumental scale. In one of the “Ground Zero” works, a stack of plastic, basketlike tables becomes a vast, alienating parking garage with the addition of rows of minuscule cars. The second half of the show is more or less explosive. Ms. Genzken breaks into her assemblage style, first with a group of modest hanging mobiles from 1997 made of shiny aluminum kitchenware punctuated with a burst of spray paint, then with a series that sends up the Bauhaus (from 2000, with an unprintable title). It combines splintery plywood bases, neon colors and disjointed buildinglike forms, one covered with seashells and tiny architectural-model trees. She circles back to Minimalism, with corrupting elegance, in the next series, tall squared-off columns covered in various sheets of mirror metal and wood veneer. Then follow small tableaus, on pedestals at eye height, of calamities and conflicts, piled with debris and sometimes manned by the toy soldiers. Finally, there are the “Ground Zero” sculptures, whose shiny forms read as resilience. Although Ms. Genzken sometimes seems to change ideas and approaches rather than develop them, her work accumulates with an insistent force and momentum that will keep you alert to what turn she will take next. “Isa Genzken: Retrospective” runs from Saturday through March 10 at the Museum of Modern Art; moma.org.